At the Law Office of Robert C. Griffin, we believe that retaining a knowledgeable lawyer is always a wise investment. Whether you are involved in an Illinois real estate transaction, have a landlord-tenant dispute or need corporate counsel, the guidance of an experienced legal professional is invaluable. Real estate law — We handle all aspects of residential and commercial real estate law, from drafting closing documents for first-time homebuyers to advising businesses on environmental compliance issues. Landlord-tenant law — Our law firm has significant experience representing both landlords and tenants in matters pertaining to security deposits, eviction proceedings, property maintenance and more. Estate planning — From drafting customized wills and powers of attorney to guiding clients through the probate process, we are here to ease our clients' concerns and protect their legacies. Business and corporate law — We provide skilled assistance with corporate leasing, buy-sell agreements, stock ledgers, annual reports, LLC operating agreements, business litigation and numerous other issues. 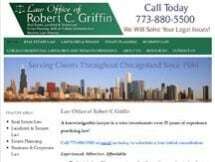 To learn more about any area of our practice, we invite you to schedule a free initial consultation by calling the Law Office of Robert C. Griffin in Chicago today.